Here's some pictures describing the trip, in basically chronological order. 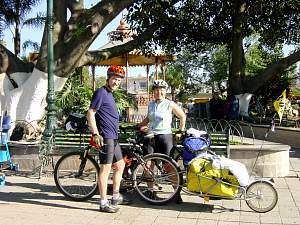 We started off in Chapala, just south of Guadalajara. It was enough outside the metro area to make the early going fairly easy. It even entailed what must be the only bike path in Mexico (ciclopista). 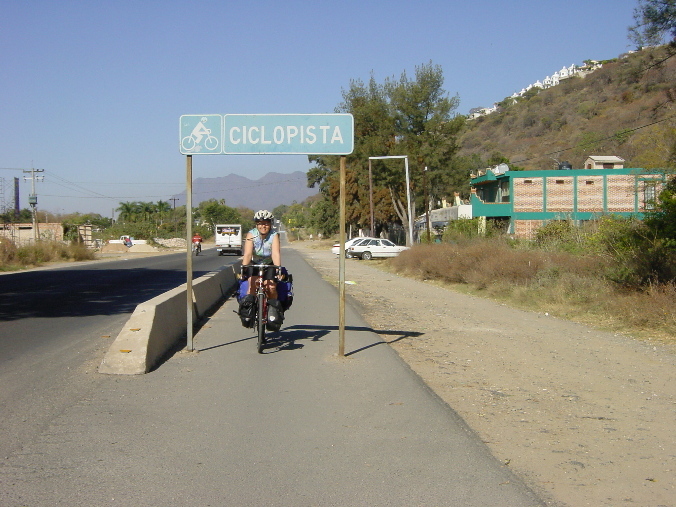 Nancy did not *even* like the traffic or the climb on the way up to Manzanilla when we left the area of the lake. In the little town of Manzanilla we planned to stop for a siesta, but young Manuel joined us on his bike and became our guide to the town. 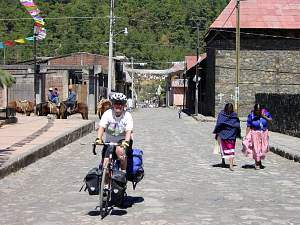 He helped Randy find a bicycle repair shop (every little town seems to have one) and a hotel where we could take a shower, and finally took us to see the church housing a tablet where an etching of the Virgin Mary had miraculously appeared. 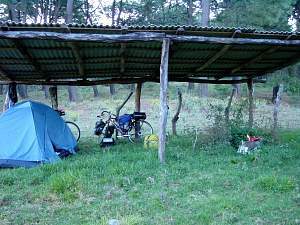 After a *big* climb we finally found our way to Mazamitla, and found a camping place in the pastures above it just before nightfall. 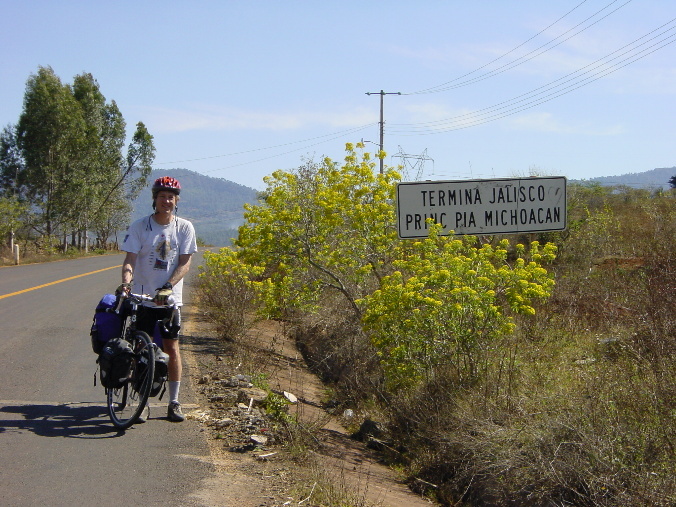 In this little town in Michoacan we found that the town was silent - all the men were working in the US. But this young lady made the most marvellous vegetable and fruit concoctions. Cane fields near Los Reyes with the ever-present volcano background. 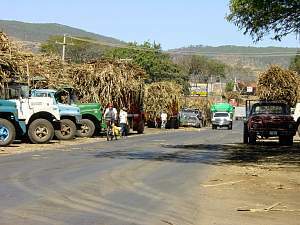 The ride from Cotija to Los Reyes suddenly had a lot of big-truck agricultural traffic. 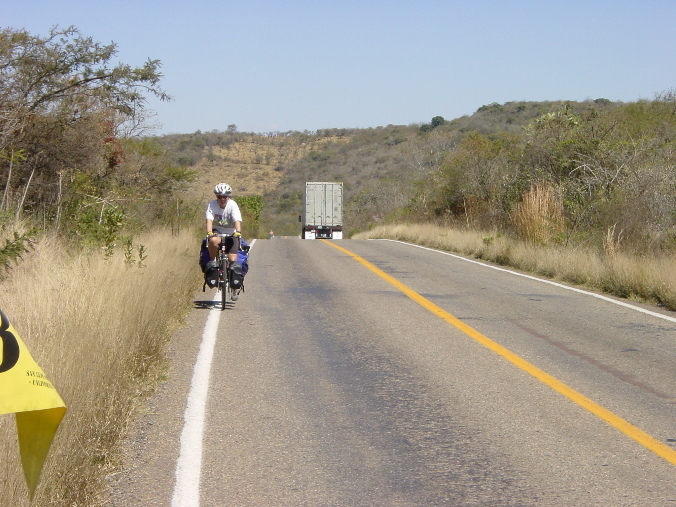 This was a big downhill with lots of big trucks and cool curves. It was kind of fun (but a little unnerving) riding with the big boys. 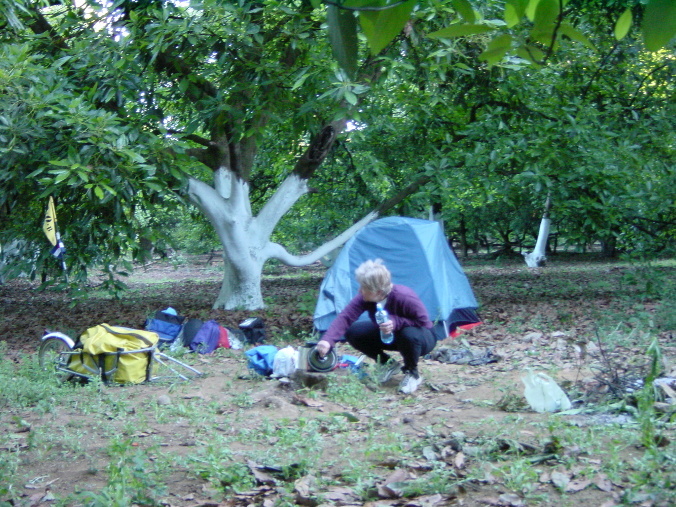 One night out from Cotija we got permission to set up camp in an avocado orchard. It was delightful -- and we had a great breakfast in the morning. 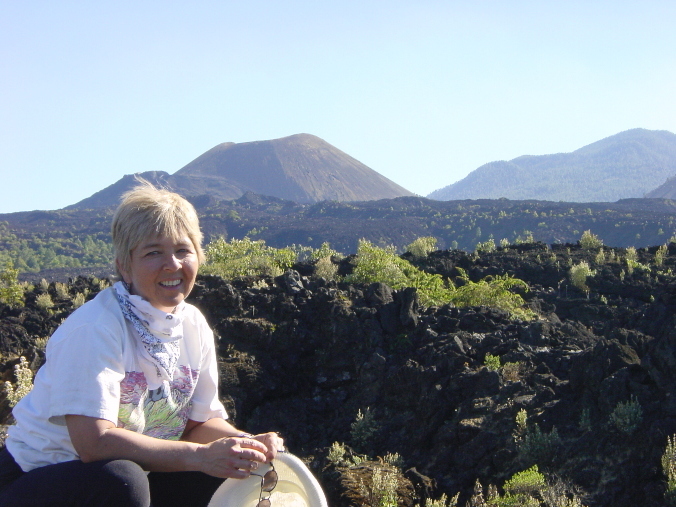 Our next major destination was the Paricutin volcano, near the town of Angahuan. 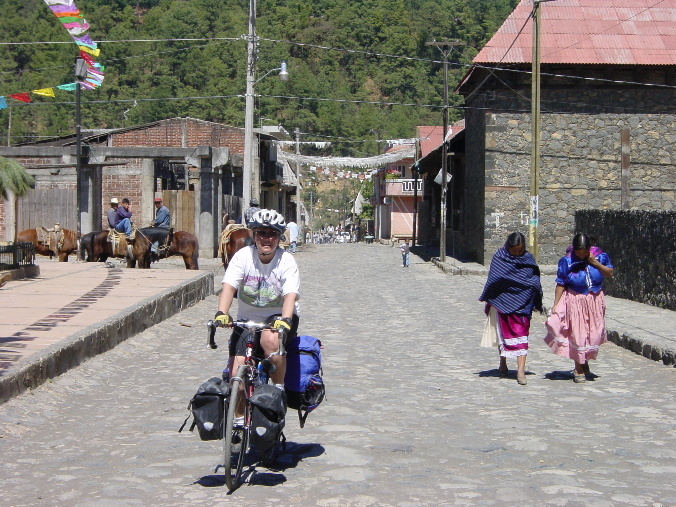 Here's Nancy riding the cobblestone streets into Angahuan. 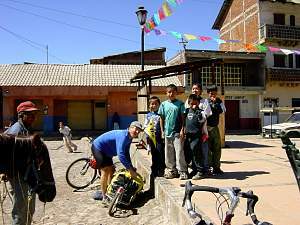 Boys gathered to help with the BOB trailer in Angahuan. 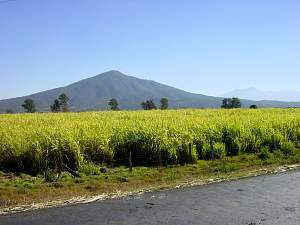 As I learned in my fourth grade "Junior Scholastic" magazine, the Paricutin volcano just appeared in a crack in a farmer's field in 1943. 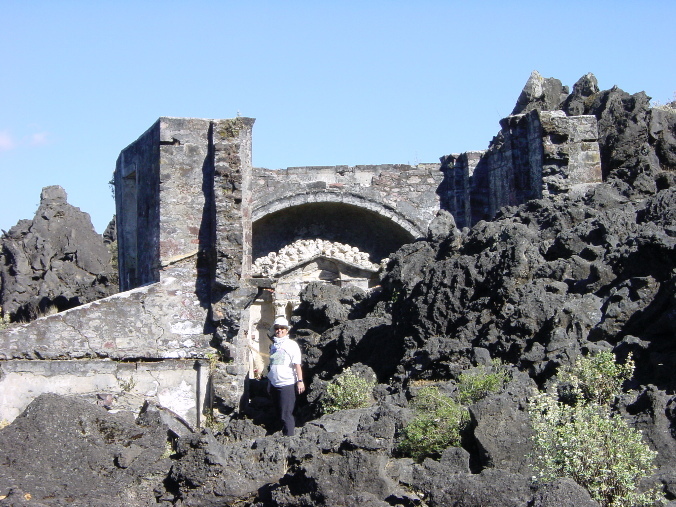 It buried this town nearly completely, but a little of the church remains. 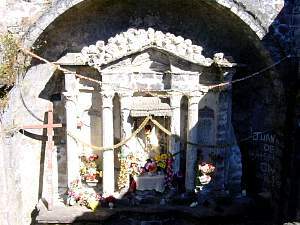 As with every altar in Mexico, the ruined, buried altar at Paricutin is still tended. Here's the Paricutin church, buried in lava, with the volcano in the background. 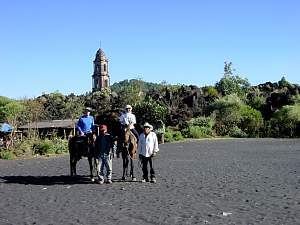 Our guides and horses in front of the buried church at Angahuan. 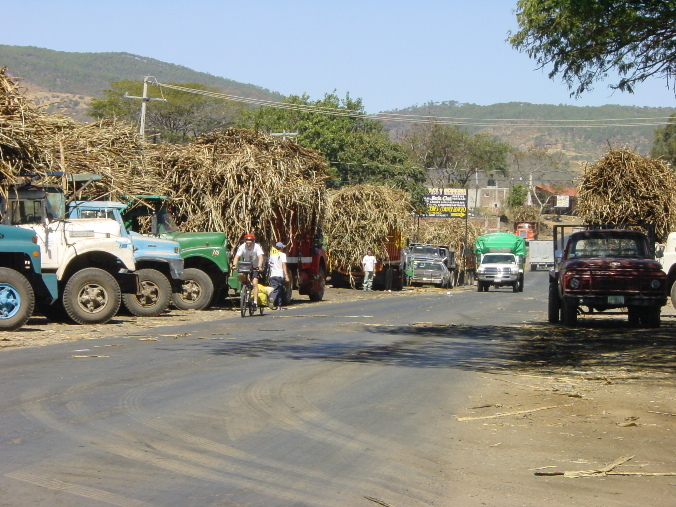 Leaving Angahuan, we wandered north trying to stay on secondary roads and avoid traffic. 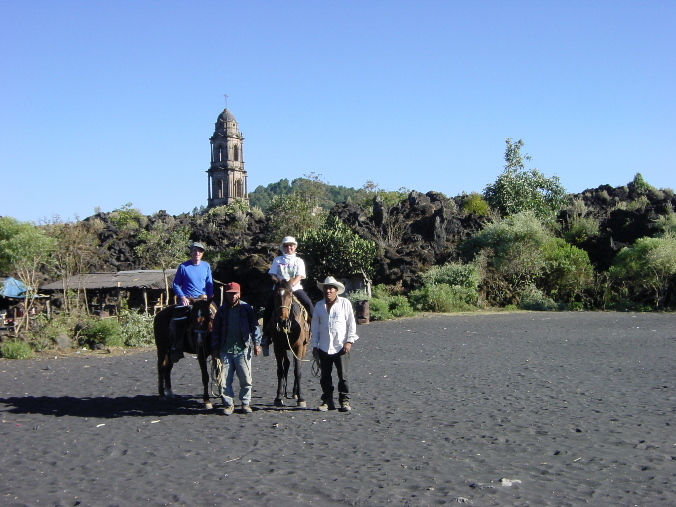 We saw the most extraordinary things - and saw more cowboys than cars. It was Saturday, and there were weddings in every town. 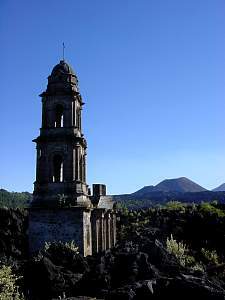 Passing the little village of San Felipe, we heard wonderful live music and stopped to investigate. 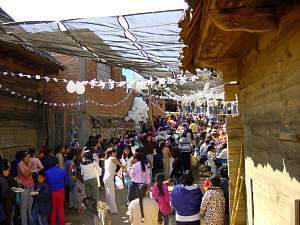 Lo and behold, there was a huge wedding in this very rustic place. 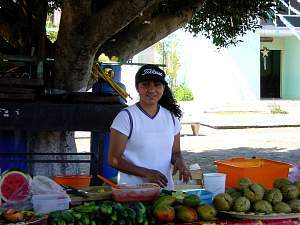 We were treated to beer and food, and just enjoyed the doings.